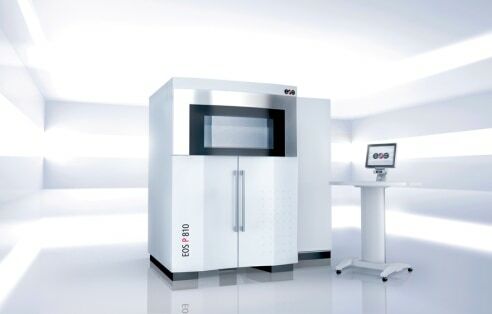 EOS, one of the leading technology providers in the field of industrial 3D printing of metals and polymers announced that it is going to launch an industrial 3D printing polymer platform – the new EOS P 810. This new polymer platform is specifically designed to process the new high-performance, Advanced Laser Material (ALM) HT-23. Advanced Laser Material (ALM) is a wholly owned subsidiary of EOS Group for its European market and a brand of materials marketed by EOS. The new 3D printing platform is developed in close cooperation with world’s largest aerospace company – Boeing – and is touted to be the world’s first economic, high-temperature polymer AM solution. The new platform is designed with an aim to manufacture high-performance parts especially the ones used in the aerospace industry. The new industrial 3D printer from EOS builds on the well-established EOS P 800 and is specifically designed for the requirements of industries such as aerospace and processes exclusively the HT-23 material. The new 3D printer will feature a build volume of 700 x 380 x 380 mm and two 70 Watt lasers. These features will enable the production of large structural parts with excellent dimensional accuracy and provides increased productivity thereby making it ideal for industrial applications. Speaking about how the new 3D printer is ideal for the aerospace industry, Scott Killian, aerospace business development manager, EOS North America said, “the aerospace industry has to meet challenging requirements when it comes to UV resistance, flame retardancy and meeting Federal Aviation Regulations (FAR) such as FAR 25.853, which sets standards for materials within compartment interiors”. “Additive Manufacturing enables the design and manufacturing of complex geometries without expensive tooling. This allows aerospace OEM’s to replace composite parts which to date are being produced manually via carbon fiber laminating”, Killian added. “They can also replace aluminum parts with HT-23 while still meeting the material strength properties required for the application. With the EOS P 810, our customers can produce lightweight parts, reduce time for production and parts assembly, and cut overall costs-per-part,” Killian further explained. On the other hand, HT-23 is the first carbon fiber-reinforced PEKK material that can be processed on EOS systems, as such offering isotropic part properties. Polyetherketoneketone or PEKK is a variant of the much known PEEK but has one additional Ketone. The additional ketone means it has better mechanical properties than PEEK. It offers better structural performance and as a result, it can prove beneficial in the further development of the materials market. Parts manufactured with PEKK material offer high strength, are lighter in weight and can withstand high temperatures. It is the first high-performance material with a low refresh rate of 40 percent. This feature of the new material greatly contributes to reduced costs-per-part. In addition to the aerospace industry, the new 3D printing solution from EOS can also be used to design and manufacture parts used in the electronics and mobility industry such as plugs or housings, serial parts, spare parts for the interior and exterior (exterior facing) of buses and trains.